Teaching with research based methods increases student engagement and understanding of material. For each teaching method find information about what makes the method effective and a collection of example lessons. Note: the list of teaching strategies below have been chosen for their application in K-12 classrooms from a larger list of research-based pedagogies on the SERC site. The following methods take different approaches to assisting educators in conducting science with students. 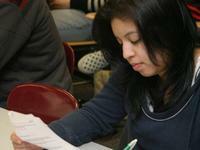 In some methods, students collect data and analyze it following a series of guided questions. In another, students are made aware of how they can conduct science outside the classroom. 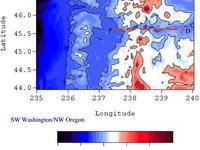 Whichever method is used, students learn how scientific knowledge is gained and learn to interpret data. Indoor Labs - Indoor labs are a staple of K-12 education. This teaching strategy encourages cooperation in small groups and participation in doing science. This resource gives tips for making individuals accountable during group work, making handouts, and structuring lab time. Also, many examples of indoor labs are given. Field Labs- Field labs are engaging to students because they can experience the science that they have been taught in the classroom. This resource has information on safety and how to choose field locations on your school grounds. Specific lesson examples are given. Process of Science- Teaching the process of science means taking the aspects of how science is conducted and making these ideas explicit for students, allowing them to discover how scientific knowledge is gained. Process-Oriented Guided Inquiry Learning - In this approach, groups of students work together through data and questions to discover a scientific concept. 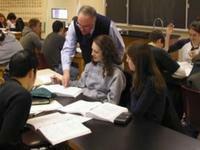 A similar resource is titled Classroom Experiments. Guided Discovery Problems - Guided Discovery Problems lead students through a progression of questions with supporting diagrams from simple to complex to build student's understanding of a concept as they discover it themselves. Campus Based Learning - Campus-based projects can provide hands-on, real-world projects that can be accomplished without a field trip budget or transportation by using buildings and grounds as teaching tools. Teaching with Data- Data can be observations, raw data, or processed data and can be collected by or presented to students. Several examples of how data can be used and sources for finding data to present to students are included. A second related resource, Using Data in the Classroom, has information regarding research supporting the use of data in the classroom and nearly 200 lesson examples. 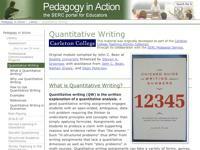 Teaching Students to Write Quantitatively - This resource teaches students how to use and interpret data in their writing. Assignments are presented that utilize a variety of formats ranging from formal essays to informal reports and posters. Group work is a way of getting students to work together to solve a problem or learn new information. By using group work, educators teach students how to learn from one another's ideas. Since scientists do not work in isolation, using group work in a structured way can teach students skills in collaboration and accountability, similar to skills scientists must have. Cooperative Learning - Cooperative Learning involves structuring classes around small groups that work together so that each group member's success is dependent on the group's success. 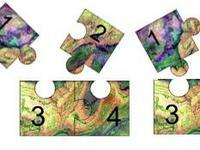 Jigsaws - In a jigsaw, teams of students prepare separate but related assignments. Teams regroup and peers then teach each other about their prepared portion of the learning. Gallery Walks - In a Gallery Walk, questions are posted at stations around the room. Teams of students rotate around the classroom, composing answers to questions while reflecting upon the answers given by other groups. Students ability to respond to higher order questioning demonstrates the degree to which they understand a particular topic. In the following methods, students are required to justify answers, apply information, or analyze ideas. These methods are very useful for eliciting student's understanding of what they have been taught and also for identifying any remaining misconceptions students may hold. 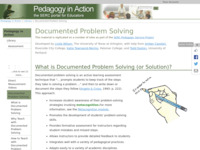 Documented Problem Solving- This process requires students to record their thought process as they solve a problem. Instead of simply presenting a solution, students must explain their reasoning for arriving at their solution. 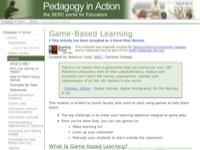 Game Based Learning - In game based learning, students compete to learn material. Included in this resource are tips for making a meaningful game, making rules fair, and grading. 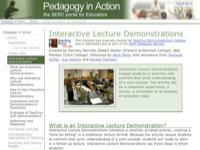 Interactive Lecture Demonstrations- This resource provides formatting for scaffolding learning from demonstrations. Students predict an outcome, observe the demonstration and reflect on their previous assumptions of the outcome. 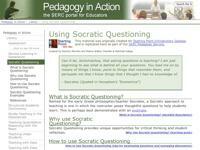 Socratic Questioning - Educators present thoughtful questions for students to discuss which cause them to think critically about a topic or issue. The educator then requires students to justify their responses. 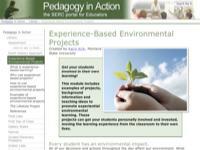 Experience based Environmental projects - Experience-based environmental projects offer a way for students to apply classroom topics like energy use, global warming, water quality and land use to their own lives, and to realize that although these issues may be global or regional, they ultimately have roots at the individual level. Civic Engagement and Service Learning - Connecting students with community members to conduct science in areas similar to what you are teaching in the classroom can be a very powerful lesson to students that what they are learning is relevant and useful to their future careers and lives as informed citizens. This resource provides more information about this approach and offers many examples you can use in your class. 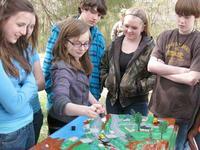 Service Learning - When students link a learning project with community service, they are conducting service learning. 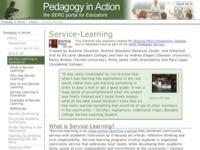 This resource presents information on why service learning is valuable, tips on how to start a service learning component in your classroom, and how to assess students' learning and get students to reflect on their work. Lecture Tutorials - This resource offers suggestions and rationale for creating worksheets for students to complete as they listen to lecture presentations. These worksheets make lectures more interactive and help students understand what information is most important from lectures. Teaching Urban Students - Urban students may experience the natural world differently than students from rural backgrounds. Urban students also may have cultural and ethnic backgrounds that may benefit from teaching in non-traditional ways. 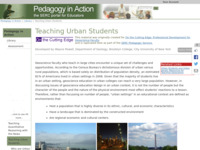 This resource presents methods for engaging urban students in science classes.